I’ve always loved leeks because they bring a special flavor to any dish. Their flavor is more delicate than onions and they go well with fish. On cooler evenings, I often love to prepare a cream of leek and potato soup because it is tasty and provides warmth. 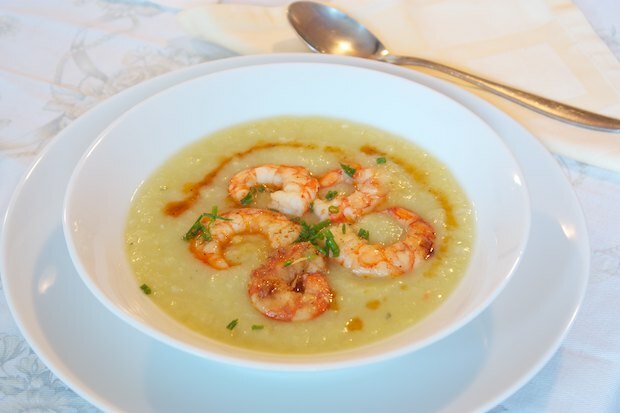 One evening at a dinner party I paired this soup with red shrimp tails from Argentina and it was highly successful! The portions are constructed so the dish can be a light supper but complete. If you serve the soup with other dishes, use a half portion and 2 shrimp per serving. In a pot, add the leeks that have been cut into rings (white part only), the potato pieces, and the small onion. Cover with a quart of water, add a little salt. Boil until the potatoes are cooked. Remove most of the cooking water with a ladle and store in a container. In a blender or food processor, blend the vegetables and slowly add the stored cooking water back into the pot until you get a thickish cream. Keep warm. Shell the shrimp, wash and dry them. In a pan, melt the butter and add the shrimp, saute for a minute or two and add a bit of Martini. Allow the Martini to evaporate over high heat and continue cooking for 5 minutes. Add salt and pepper. Ladle the soup in individual serving bowls and gently place 5 shrimp tails on top with a bit of the reduced liquid over the shrimp. Cut the chives and sprinkle a bit over the shrimp. Posted in Soups and tagged with Cream of Leek Soup with Shrimp, Crema di Porro con Gamberi. RSS 2.0 feed.